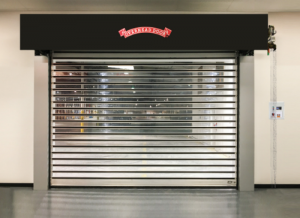 October 29, 2018 – Overhead Door™ Brand, one of the leading brands of garage doors and openers for residential, commercial and industrial applications, has expanded its collection of high speed doors with two new metal doors — RapidShield™ Model 998 and RapidView™ Model 999. Operating at up to 80” per second and engineered for over 1 million cycles, these high speed metal doors are ideal for applications requiring a reliable, fast-acting door to accommodate high-traffic areas such as parking garages, auto dealerships, manufacturing, warehouse or distribution facilities. Keeping design flexibility in mind, both models provide the same speed, security and durability features with the benefits of diverse styles. RapidShield™ Model 998 provides a solid, dual-walled aluminum curtain for applications where privacy is a top priority, while RapidView™ Model 999 offers a full-view door featuring scratch-resistant polycarbonate panels for maximum visibility and light infiltration, creating an architecturally striking aesthetic. All doors come with static and operational pressure ratings, similar to the previously launched RapidFlex™ Models. “Our high speed metal doors not only give business owners more control over what door style better fits their needs, they also save businesses valuable time and money with their springless design. Enduring constant operation, RapidShield™ Model 998 and RapidView™ Model 999 eliminate the need to replace damaged springs, saving business owners maintenance costs and reducing downtime. The installation has also been streamlined through key aspects of the doors including the door header assembly, and utilizing the same control system and quick connect wiring as our RapidFlex™ product providing familiar technology to installers,” said Mark Sawicki, Overhead Door High Speed Door Product Manager. The high speed metal doors are built for smooth and easy operation boasting a gravity drive system with variable frequency drive that eliminates sudden jolts and wear and tear from the door start/stop motion. A built-in motor break provides additional protection against uncontrolled curtain travel in busy areas. The models offer customizable options, including 200 RAL powder coat finishes available on all pieces, as well as scratch-resistant vision slats for RapidShield™ Model 998. ©2018 Overhead Door Corporation. Overhead Door™ is a trademark and the Ribbon Logo is a registered trademark of Overhead Door Corporation.